On 7 July, a month after the murder of Antonio Vivar Díaz, an activist from the Popular Guerrerense Movement (MPG), at the hands of federal police, some 2,000 teachers, retirees, and neighbors of the Tepeyac community marched in Tlapa to demand justice and punishment for those responsible. 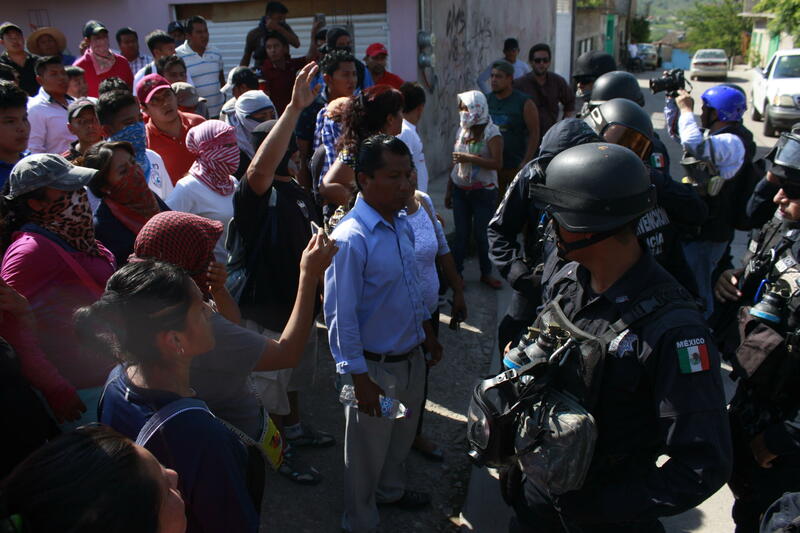 On 7 June, election day, Federal Police arrested eight people from El Tepeyac while lacking any arrest-orders. The tensions between the federal police and neighbors was controlled at about 8pm, when it was agreed that the 8 prisoners would be released and transferred to Tlapa, in exchange for 30 federal police who had been taken by the community. Regardless, this agreement was broken by the police and military, who entered forcibly using tear-gas to rescue the detained police. This action caused the death of the activist and teacher Antonio Vivar Díaz by gunshot. 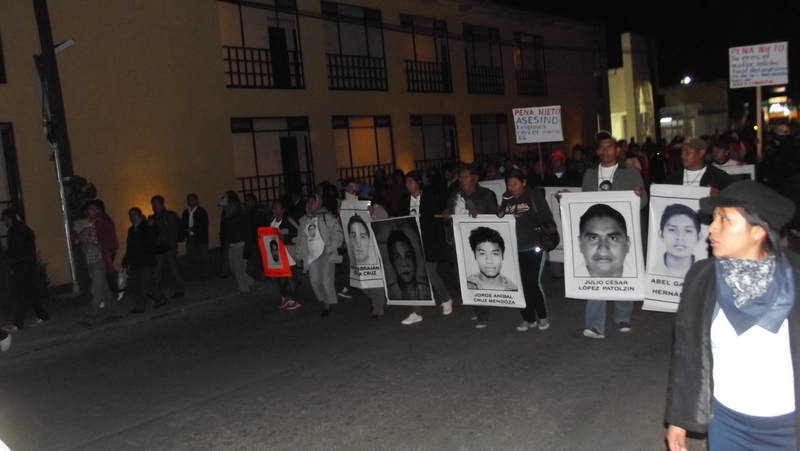 On 12 November, in Ayotzinapa, Guerrero, relatives of the disappeared students and the student committee reported on the activities of the National Brigade regarding the presentation with life of the 43 disappeared normalist students from Ayotzinapa. The brigade was organized into three branches, one towards the north (passing through the states of Chihuahua, Durango, Zacatecas, Jalisco, and Michoacán); one toward the south (visiting the states of Chiapas, Oaxaca, Morelos, and Tlaxcala), and another state brigade in Guerrero, which visited the municipalities of Tlapa, San Luis Acatlán, Ayutla, Tecoanapa, Zihuatanejo, Atoyac, and Acapulco. The three caravans met in Mexico City on 20 November to conclude their work with a mass-march and rally in the Zócalo. The objective of the Brigade was to collect direct information regarding the acts of 26 and 27 September, the investigative process, and the search for the 43 disappeared students, beyond making proposals for the elaboration of a program for struggle and action that would transform the causes led to the events seen in Iguala. The “Daniel Solís Gallardo” Brigade arrived to Chiapas on 14 November, being named for one of the normalist students who was killed on 26 September, and it led a march through the streets of San Cristóbal de Las Casas, to the applause of onlookers. “Alive they took them; alive we want them,” “Ayotzinapa, hold on; Chiapas is rising” together with other slogans were heard until the march reached the Cathedral Plaza. At the rally, two women spoke, being the mothers of two of the disappeared. They said that they no longer have fear, and that they are prepared to give their lives to find their sons, because though the government says they are dead, they believe in their hearts that they are still alive. On 15 November, the members of the Brigade visited the Zapatista caracol of Oventik, where they met with the high command of the Revolutionary Clandestine Indigenous Committee of the Zapatista Army of National Liberation (EZLN), and the EZLN expressed its sympathy for the pain, rage, and powerlessness of the parents who still have yet to find their sons. 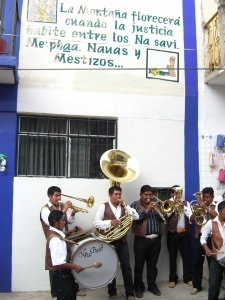 The activities in San Cristóbal de Las Casas concluded with a press-conference during which Brigade members noted that the EZLN had suggested that they “visit those who like us have suffered forcible disappearances or extrajudicial executions–who are not few in number in this country–because it is only they who will understand us and accompany us in our pain and struggle. It is they with whom we can articulate a movement, a larger and more powerful nucleus with all the social organizations that would like to join,” following their return through Oaxaca. 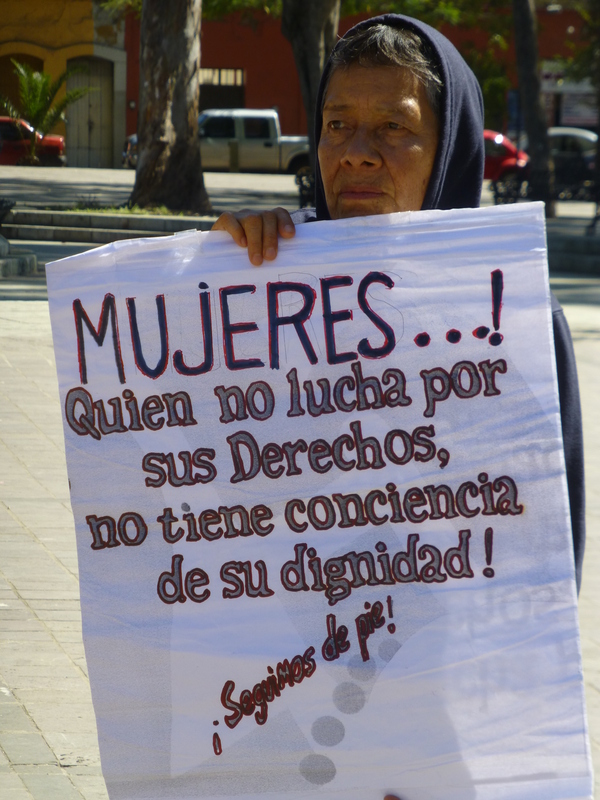 In observance of the International Day of Non-Violence toward Women on 25 November, different collectives and organizations carried out acts of denunciation in the capital of Oaxaca. A caravan-march carrying dozens of paper coffins representing the 240 femicides that have taken place during the administration of Gabino Cué took to the streets of the city to Santa María Ixcotel, where participants demanded the punishment of the murderers and clarification of the cases. The organization Consorcio for Parliamentary Dialogue and Gender Equity denounced the inefficacy of the Oaxacan justice system which via omission has allowed for an increase in disappearances and murders against women, stressing that 99% of the cases find themselves unresolved, with the perpetrators unpunished. In this sense, Consorcio accuses judges of partiality and demands that sentences incorporate gender perspectives. Beyond this, members of the National Network of Young Pro-Choice Catholics carried out a march through downtown Oaxaca City which ended at the Palace of Governance, where flowers and crosses were left behind to represent the murdered women, and protestors demanded that the government put an end to the impunity amidst the increase in femicides and sexual violence. Also on 25 November, in Guerrero, President Enrique Peña Nieto announced the construction of a Center of Justice to provide legal, psychological, and economic support for women who are victims of violence in the state. The center was inaugurated in Tlapa, in the Mountain region, and it represents the first phase of a communal project called Women’s City, which seeks to build offices to provide comprehensive attention to women who suffer violence or have been abandoned or trafficked.